Health risks associated with the Fukushima Daiichi nuclear power plant incident in Japan such as cancer are low overall, according to a United Nations report released today, which calls for continued health and environmental monitoring in the areas most affected by the disaster that occurred two years ago. In March 2011, Japan was struck by an earthquake and tsunami that killed more than 20,000 people in the eastern part of the country. The tsunami also slammed into the Fukushima Daiichi nuclear power station, located in Fukushima Prefecture, disabling cooling systems and leading to fuel meltdowns in three of the six units. However, the report also notes that the risk of specific cancers for the population living in the most affected parts of the Fukushima Prefecture is slightly higher. “The primary concern identified in this report is related to specific cancer risks linked to particular locations and demographic factors,” said WHO Director for Public Health and Environment Maria Neira. For people in the most contaminated area, the report estimates that there is a 70 per cent higher risk of females exposed as infants of developing thyroid cancer over their lifetimes. The report, ‘Health Risk Assessment from the nuclear accident after the 2011 Great East Japan Earthquake and Tsunami based on preliminary dose estimation,’ was carried out by scientific experts on radiation, epidemiology and public health, among others, who estimated risks in the general population in Fukushima Prefecture, the rest of Japan and the rest of the world. Experts also stated that the psychosocial impact of the nuclear disaster may have a long-term consequence on the health and well-being of the population, and this should be addressed as part of the overall response along with the environmental impact to prevent future incidents of this nature. “In addition to strengthening medical support and services, continued environmental monitoring, in particular of food and water supplies, backed by the enforcement of existing regulations, is required to reduce potential radiation exposure in the future,” said the Acting Director for WHO’s Food Safety and Zoonosis Department, Angelika Tritscher. 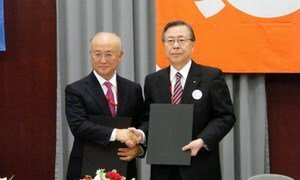 An agreement between the United Nations International Atomic Energy Agency (IAEA) and administrators from Japan’s Fukushima prefecture was signed over the weekend, ushering in a new era of emergency preparedness and radiation monitoring for the beleaguered Japanese prefecture.